Pate is full of essential nutrients such as: Iron for healthy blood, Folate for healthy cell regeneration and protection from heart disease, B12 for a healthy nervous system, Vitamin B6 for healthy hormones and protein metabolism, Vitamin A for healthy eyes, skin and respiratory tract, Zinc for healthy skin and immune system, Protein for growth, repair and regeneration, and Choline for healthy nerves and muscles. With that long a list, how could you not eat it? Trim livers of any sinew. Heat butter in a large heavy-based frying pan. Place livers, onions, garlic and Grand Marnier in frying pan. Stir over medium heat until the liver is just cooked and onion is soft. Bring to boil and simmer for 4 – 5 minutes. Remove from heat, cool slightly. Place mixture in food processor or blender and process for 20 – 30 seconds or until smooth. Add cream and process for another 10 seconds. Transfer mixture to a bowl and stir in herbs. Season with salt and pepper. Refrigerate overnight or until firm. 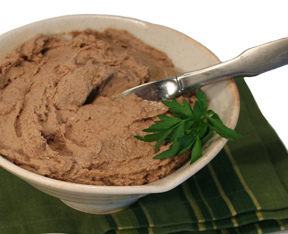 Serving suggestion: Enjoy your pate on toast at breakfast time, or as an entrée with crackers or crusty bread. My personal favourite way to eat it is direct from the bowl with carrot sticks! TIP: Pate can be made up to three days in advance. Cover and refrigerate.